View More In Cake Knives. Please contact customer service for the first time if you have questions or comments, we will reply you ASAP. If the return is caused by the product quality or the mistake from us, we are fully responsibility for all. Size: Length: 33cm (13 inches), Width: 4.32cm (1.7 inches), Height: 0.25cm (0.1 inches). Wipe the blade with a clean dry cloth after every using and store in dry area. 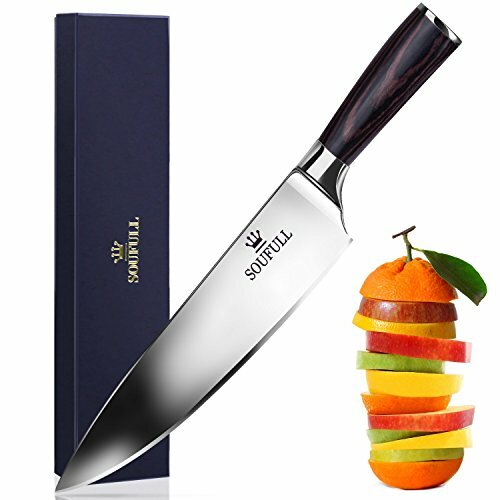 【Top High-carbon Stainless Steel 】 The 8-inch chef knife is made of high-quality stainless steel which contains 0.6%-0.75% carbon for 2x harder than other brand knives as they only contain 0.3%. 【Multi-purpose Kitchen Knife 】The chef's knife is multipurpose for cutting, dicing, slicing, chopping as well as mincing. It's really a perfect kitchen tool no matter you are cooking Asian, French, Italian, Japanese, Thai, Indian, Chinese, Korean and so on . 【Superior Pakka Handle】 The superior Pakka wood is largely waterproof compared with normal pakka wood, providing much of the same look and feel as wood but without the warping and splitting common in real wood. It can minimize any fatigue, finger numbness or aches after holding long time. 【Sharp&durable Edge】 The HRC( Rockwell Hardness Scale) of 58-60 ensures the knifes edge is stronger and more durable than ordinary knives as well as the sharpness.So it can remain ultra sharp very well even after doing a tough job such as cutting tough meat or removing flesh from bones. If you have any questions about this product by Soufull, contact us by completing and submitting the form below. If you are looking for a specif part number, please include it with your message.